Although everyone expected the governing Serbian Progressive Party (SNS, Српска напредна странка) to win Serbia’s parliamentary elections on Sunday, no one quite expected the Progressives to win such a stunning mandate — the first time in the post-Milošević era that a single party won an outright majority in the Serbian parliament. Although the Progressives went into Sunday’s election with the largest bloc of seats in the 250-member National Assembly (Народна скупштина), the fluke of the previous elections in May 2012 left the Progressives stuck in coalition with the center-left, nationalist Socialist Party of Serbia (Социјалистичка партија Србије / SPS), and the Socialist leader Ivica Dačić as prime minister instead of a Progressive prime minister. RELATED: Who is Aleksandar Vučić? Meet Serbia’s next prime minister. Back in 2012, the Progressives were unwilling to enter into coalition with the center-left Democratic Party (Демократска странка / DS), and Progressive leader Tomislav Nikolić had just defeated Serbian president Boris Tadić, ending eight years of Tadić-led, Democratic government. That gave Dačić, whose Socialists finished a surprisingly high third-place in the 2012 elections, the power to decide whether he would enter government with Progressives or with the Democrats. After weeks of negotiations, Dačić chose the Progressives. The price for the Progressives was to allow Dačić to become prime minister. Dačić’s record isn’t incredibly poor — he presided over the official opening of accession talks for Serbia’s ultimate entry into the European Union, his corresponding efforts to integrate Serbia into mainstream Europe have brought Serbia and Kosovo closer to a long-term settlement over Kosovo’s status (and Kosovo’s own future European integration), and the Serbian economy is doing better than it was two years ago, despite a broader push of austerity measures over the 21-month government. But with polls showing the Progressives with such a wide lead, and with the Serbian left divided between supporters of Tadić and supporters of former Belgrade mayor Dragan Đilas, the tail-wags-the-dog world of a Socialist-led government made increasingly little sense to top SNS leaders, most especially Aleksandar Vučić, the first deputy prime minister who is now set to become Serbia’s prime minister for the next four years. Even before the Progressives essentially demanded snap elections in January, Vučić and his young, Yale-educated finance minister Lazar Krstic were setting more government policy than Dačić. 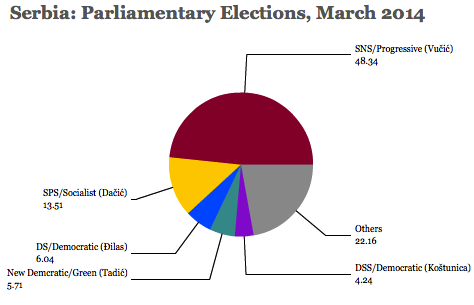 Sunday’s election was a landslide for Vučić and the SNS, which outpolled its nearest competitor, Dačić’s SPS, by more than a 3-to-1 margin. Đilas’s Democrats won just 6% of the vote, and Tadić, leading the alternative center-left bloc, the New Democratic Party/Greens (NDS, Нова демократска странка — Зелени), won just 5.7% and 18 seats. 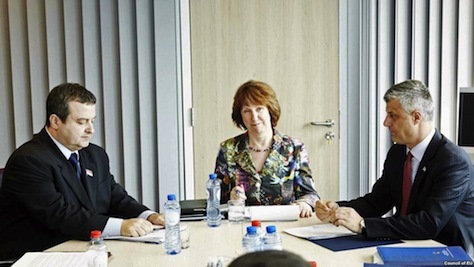 The most important EU success story you’ve never heard? Serbia. The global media’s attention this weekend will be fixed on Crimea, where a status referendum is almost certainly likely to result in its annexation into the Russian Federation. But the world’s attention should be on Serbia, which is holding snap elections on March 16 — the same day as the Crimean referendum. Serbia’s parliamentary elections come just two months after formally opening negotiations to join the European Union, a landmark step in what’s been a decade-long push for greater Serbian-EU integration. When political commentators tell you that Ukraine is the frontier of the European Union, they’re right that European policymakers have both an economic and security interest in Ukraine’s stability. But the true frontier of the European Union is the Balkans, and no country is more vital to the future political and economic stability of the region than Serbia, home to over 7 million residents, the most populous of the Balkan states. Polls show that the outcome of Sunday’s election is almost certain — a wider majority for the center-right Serbian Progressive Party (SNS, Српска напредна странка), which as a member of the current coalition government, is working to tackle corruption, liberalize and privatize sectors of the Serbian economy and bring Serbian budget closer to balance — all while the country faces unsteady economic growth and an unemployment rate of 20%. Notwithstanding the real economic pain today in Serbia, none of that matters as much as the fact of Serbian continuity with respect to European integration. Though Serbia’s formal accession may take up to a decade, Serbia seems certain to become either the 29th member (or the 30th member, following Montenegro) of the European Union. What’s more, the most significant fact of Serbian political life in the past two years has been the durability of the national commitment, across all major political parties and ideologies, to Serbia’s eventual EU membership. Think back to the breakup of Yugoslavia in 1991. Or to the ‘ethnic cleansing’ that marked the civil war among Croats, Bosnian Muslims and Serbs between 1992 and 1995 in Bosnia and Herzegovina. Or to the Serbian aggression over Kosovo that led to NATO military action against Belgrade in 1998-99 and the emergence of the semi-independent Kosovo today. Or to the dictatorship of Serbian strongman Slobodan Milošević from 1987 until 2000, with full-throated support from Moscow. Though it’s something that we take for granted in the year 2014, it wasn’t always a foregone conclusion that Serbia today would be so united in its push to turn economically and socially toward Europe. It wasn’t even so clear in 2012. In the last parliamentary elections in May 2012, the SNS won the greatest number of seats (73) in Serbia’s 250-member National Assembly (Народна скупштина), and the SNS’s Tomislav Nikolić, running for the fifth time, narrowly won the Serbian presidency over incumbent Boris Tadić, whose center-left Democratic Party (Демократска странка / DS) had governed Serbia since 2004. Tadić, throughout the 2000s, laid the groundwork for greater cooperation with the European Union. 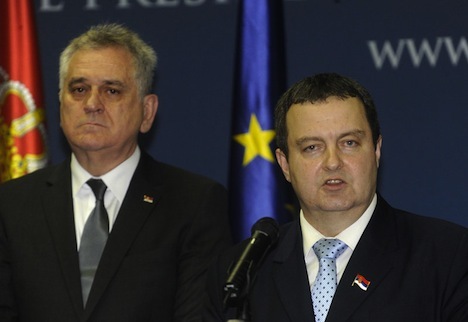 As Serbia takes another step closer to joining the European Union, its government is headed to snap elections on March 16, with the Serbian Progressive Party (SNS, Српска напредна странка) of president Tomislav Nikolić hoping to replace prime minister Ivica Dačić with its own leader, Aleksandar Vučić, after just 18 months since Dačić took office. Dačić and his Socialist Party of Serbia (SPS, Социјалистичка партија Србије) emerged in the May 2012 parliamentary elections as the surprisingly strong third-place winners. That gave Dačić and the SPS the power to determine whether the new government would comprise an alliance with Nikolić’s center-right Progressives or the center-left Democratic Party (DS, Демократска странка) of former president Boris Tadić. Nikolić, on his fifth attempt to win the presidency, edged out Tadić in the May 2012 presidential runoff, bringing Tadić’s eight-year tenure to an end. As the kingmaker for Serbia’s next government, Dačić (pictured above, right, with Nikolić, left) decided to crown himself king — and Dačić became prime minister, though his Socialists, with 44 seats in Serbia’s 250-member National Assembly (Народна скупштина), were technically the junior partner in coalition with the Progressives, which hold 73 seats. (The Democrats currently hold 67, and three more minor parties each hold between 16 and 21 seats). The Dačić-led government oversaw an economic recovery — a 1.7% contraction in 2012 transformed into an estimated 2.4% expansion in 2013. In any event, there’s no doubt that the Serbian economy has marked a definite improvement. Though unemployment remains high at around 20%, it’s fallen from a high of around 25.5% in early 2012. Moreover, Serbia achieved significant progress on EU membership, with negotiations opening earlier this month and ongoing EU-brokered negotiations on the fragile relationship over the future status of Kosovo, despite concerns in 2012 that Nikolić and the Progressives have historically been closer to Russia than to western Europe and wary of EU accession. The EU talks will rank among the top issues in the election campaign, including the reform program that Brussels requires as a prelude to membership, which could significantly boost the Serbian economy. But a year and a half into government, Nikolić and the Progressives believe the time has come for Vučić to assume the premiership — and polls show that Serbians agree. With a fresh mandate, Vučić will push forward with the EU negotiations, and there’s a chance that a new Progressive-led administration work with the IMF for a package of guarantees to reduce lending costs. A Faktor poll last week showed that 42.1% of Serbia’s electorate support the Progressives, while just 13.9% support the Democrats and 10.5% support Dačić’s Socialists. Two other parties achieve significant support: the eurosceptic, conservative Democratic Party of Serbia (DSS, Демократска странка Србије), led by Vojislav Koštunica, Serbia’s president from 2000 to 2003 and prime minister from 2004 and 2008, would win 6.8%; and the free-market liberal, centrist Liberal Democratic Party (LDP, Либерално-демократска партија), led by Čedomir Jovanović and several former Democratic Party members, would win 5%.